Purchasing cadet kit, such as army boots and uniform was a bit of a hit or miss affair back in the 90’s. Firstly the internet didn’t exist as a marketplace – and hardly any businesses were selling online. Mail order companies sent out printed paper catalogues by post and customers would fill in a coupon and send it back. This would be sent to the company with a cheque or debit card details, The order would then be processed. As you can imagine things didn’t happen as quickly as they do today. Where did cadets buy their kit from? As well as a few mail order companies, back in the 1990’s many high streets had their own army surplus shop which would stock items like second hand military uniform, army boots and survival equipment. Some shops were better than others but it was impossible to get a wide range of items from a single shop. What’s more you couldn’t really buy rank slides or cadet badges. Cadets would rely a lot more on kit sourced via their unit, either through official issue or by buying cadet kit from other cadets in their unit. Cadets were more likely to use equipment they had around their home such as sleeping bags and water bottles rather than buying the military style equipment available today. You’d often see brightly coloured equipment like torches wrapped in black tape to make them look more tactical. Red filters for torches could be made using the red plastic used to wrap certain sweets. Camouflage cream could also be hard to find – burning a wine cork and using that to blacken your face, neck and hands was often used instead. Rather than purpose made military rucksacks, canvas rucksacks were sprayed with paint to make them look camouflage. Most importantly cadet boots were traded between new recruits and those planning to leave. Webbing sets were particularly difficult to obtain. Such kit was rarely issued and needed to be purchased privately mostly through army surplus shops – if they had any! 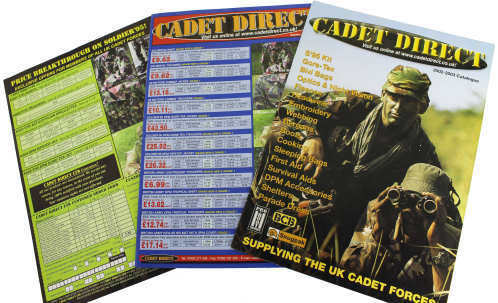 The only specialist cadet supplier back in the late 1990’s was the Cadet Supply Department. This was a service operated by the Army Cadet Force Association (ACFA) based in central London. The service was quite basic and was really targeted at CFAV’s rather than cadets. The range of goods was extremely limited consisting mainly of badges, accoutrements and rank slides. John Harris, the original creator of the cadet pocket book series would often travel to camps in his specially converted camper van in order to sell accessories and his range of cadet books. John went on to create a wide range of successful cadet publications, including the Cadets Pocket Book, The Air Cadet Pocket Book and The Soldiers Pocket Book. It was during this time that two young serving Army Cadet adults, Lt. David Shearn and Lt. James Munday began to develop the idea of an independent commercial business designed specifically to supply cadet equipment. Both had been senior Army Cadets in SE London Army Cadet Force and had many years of experience training as cadets. Being independent meant the business would be free from the administration and regulations of the cadets forces themselves and be free to supply the type of kit that cadets and their instructors wanted. 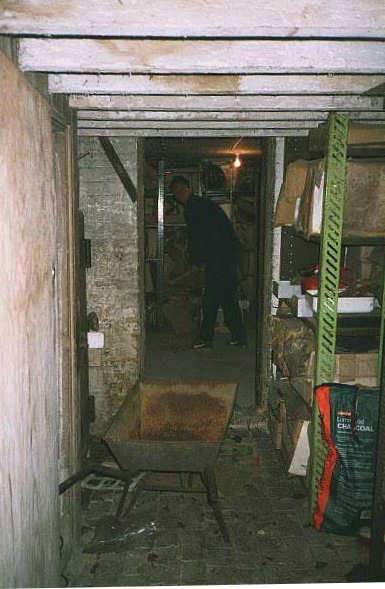 With the kind permission of Ruby Tomlin (James’ grandmother), an initial base of operations was set up in the basement of a large Victorian house in South East London. The first step was to clear thousands of wholesale vinyl records which had been in storage since the 1960’s and 70’s. Before the dust could settle, the empty shelving was restocked with DPM army uniforms and rank slides. Creating Cadet Direct’s first premises back in 1999. Cadet Direct’s early offerings had an instant impact on the marketplace and within 12 months the company was looking for a larger commercial premises to operate from. Eventually in 2001, a unit was located in Crowborough, East Sussex. This location was a reasonable distance between Sussex ACF, where Lt. Shearn was now located and SE London ACF where Lt. Munday still served. Operating from the new unit allowed Cadet Direct to expand it’s range and stock holdings in order to improve it’s service to customers. With the new premises, Cadet Direct was able to expand it’s offerings to include more extensive ranges of cadet boots, air cadet uniform and cadet rank slides. Furthermore a unique marketing strategy combined with the launch of one of the UK’s first military equipment websites lead to a further growth in the business. By 2005 Cadet Direct had outgrown the 1800 sq. 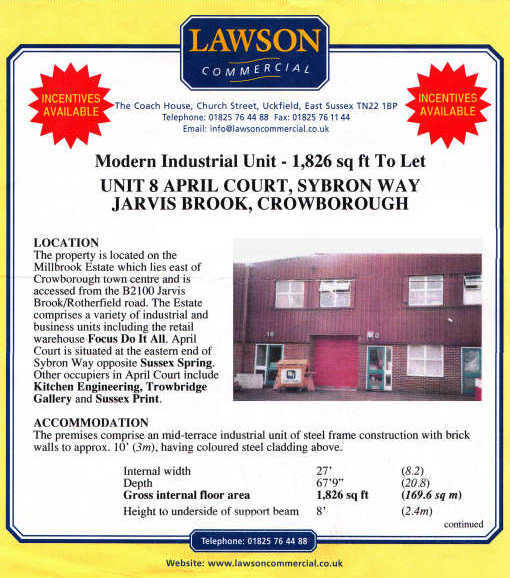 ft. warehouse at Unit 8 April Court and moved to a new larger premises next door (Unit 9/14). After 9 years of consecutive sales growth and the continued expansion of product ranges it was necessary for the business to spread further into the adjacent building. This was achieved literally by smashing down an adjoining wall with a sledge hammer! In 2005 Cadet Direct created a sister company called Survival Aids UK Ltd. The aim of the new business was to extend the sales and marketing strategy to include the UK’s regular and reserve forces. A website was designed and launched and sales grew quickly driven in part by increasing deployments resulting from the Iraq (2003-11) and Afghan conflicts (2001-14). Despite the fact that the business was now operating with approximately 6000 sq. ft. of warehouse and office space, by 2010 the company had yet again outgrown its premises and needed a bigger warehouse for stock and a workforce of 15. Previous	Cadet Direct ACF CCF 2019 Skiing Bursary – from one ‘mountain’ to another!